A simple, convenient way to store everyday household items, including books, DVD's, CD's, documents, and more. Made of durable metal with a mesh exterior, cut-out handle and gray silver powder-coat finish. Neatly align side by side for optimal storage space. Minimal, lightweight design with optimal functionality and practicality. No assembly required. SPECS (in inches): 5.5 H X 10.5 W X 6.0 D.
MESH STORAGE BOX: Modern home and office metal mesh CD storage box with black powder-coat finish. FUNCTIONAL DESIGN: Features a mesh exterior with a durable metal frame and easy access semicircle cut-out handle. 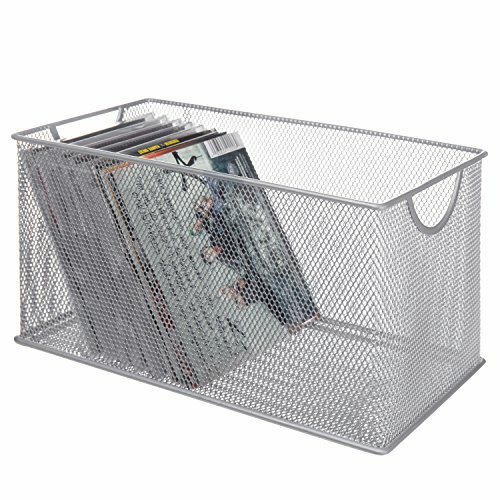 MULTIPURPOSE USE: Can be used to organize, store, or transport items easily on moving day or garage sales. SPECS (in inches): 5.5 H X 10.5 W X 6.0 D.